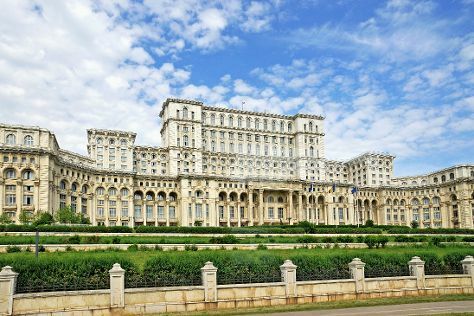 The booming city of Bucharest is a sophisticated metropolis with a high contrast of old- and new-world architecture. Nicknamed "Little Paris," Bucharest reflects a strong French influence in the 20th-century architecture, the locals' gravitation towards the high life, and the city's very own Arc de Triomphe. The Palace of Parliament is perhaps Bucharest's largest tourist attraction and the second largest building in the world after the Pentagon. And while Romania's capital city may often get a bad reputation for its communist past, this funky town where industry meets cobblestone pedestrian streets is not to be missed. Bucharest is in Romania. Make your own Bucharest vacation itinerary, with a little help from those that know the place like the back of their hands, by using our Romania trip planner . To take advantage of Bucharest's lively downtown, look for accommodations in the areas of Universitatii square, Unirii, Romana, or Victoriei to be closest to bars, clubs, and restaurants, as well as many of the major sights. Choose from a variety of hostels and budget hotels, or book a night at one of the mid-range or luxury hotels. If you decide to venture farther out of the city, look for lodging close to public transportation to avoid the city's notoriously bad traffic.